South America along Pacific coast from northern Peru to central Chile. The Humboldt Current, which is a cold, low-salinity oceanic current that flows north along the western coast of South America from Chile to Peru. This is the largest ocean upwelling in the world and it forms the basis for the world’s richest and most productive marine ecosystem. Gregarious, living and nesting in huge colonies of several thousands of birds, often close to gulls’ colonies; will share breeding islands with cormorants and penguins. When hunting, it spots its prey from the air, diving into the water to grab meals with its pointed beak. Will also feed by surface-dipping or by sitting on the water and picking up prey from the surface. Not a strong swimmer as its webbed feet are too small. Will often accompany fishing cormorants, sea lions, and cetaceans. Average life expectancy is 12-14 years but can live into their 20’s. Diet in the Wild: Small fish including anchoveta (Engraulis ringens), mote sculpins (Normanychtic crokeri), and silversides (Odothestes regia regia). Additionally, Inca terns scavenge scraps left by sea-lions, dolphins, and fishing boats. They occasionally plunge down onto sea lions and dolphins taking the chewed-up food from between their teeth. Diet in the Zoo: Fish, including capelin and smelt. Both sexes are similar. Adult length is 16 inches (41 cm). Adult weight is 6 -7.5 oz. (180-210 gms). Dark gray body, white mustache, and yellow wattle on both sides of head. Read-orange beak and feet. Juveniles lack mustache and have brown plumage. Monogomous. 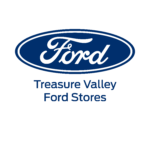 Breeds twice per year, between April and July and between October and December. Courtship is an elaborate ritual, especially in birds seeking a mate for the first time. The first stage is “high flight”, in which the male ascends at speed to often several hundred meters, while the female pursues him. Courtship feeding and zigzag dancing in the sky has great symbolic value: it helps the female Inca tern gauge the fishing skills of her partner. The male also pursues her in the air with gifts of fish until she finally accepts him. Ground courtship occurs near the nest site, and involves much strutting around and pirouetting with raised tail and drooped wings. This is usually a prelude to copulation. Breeding habitat is inshore and occasionally offshore island and rocky coastal cliffs. Unlike most terns, which tend to nest on open ground, Inca terns select sheltered nest sites. Nests are placed in suitable fissures, burrows, caves and cavities, sometimes in abandoned Humbolt Penguin nesting burrows. 1 or 2 eggs are incubated for about 4 weeks. Chicks leave the nest after 7 weeks and will breed at age 2 or 3. The Inca tern has a streamlined shape for diving and plunging into water during feeding. 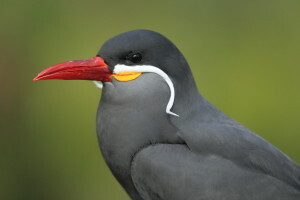 The mustache ornaments seem to provide a good indication of individual quality among adult Inca terns. Adult Inca terns with longer mustaches were the most productive and their chicks were heavier and had better immune responses. Listed as “near threatened” because its population has experienced a recent moderate rapid decline. Reduction of nesting habitat as a result of guano harvesting may affect population dynamics. Guano was widely used as fertilizer since pre-Inca times and sustained Peru’s economy between the mid 1800’s and early 1900’s. The importance of guano to the Peruvian economy diminished in the mid 1900’s when organic fertilizers were replaced by synthetic alternatives. However, at the same time, industrial fishing became and increasingly significant activity, reducing the availability of food for “guano” birds such as the Inca Tern. However, Inca Terns are very flexible and successful in using any kind of coverage (natural or artificial) for nesting. They can nest inside abandoned buildings and huts on guano islands, and in any pile of wood and metal slabs. The presence of rats and cats on some islands can also prevent nesting or reduce breeding success. In 2009, the Peruvian government created the Guano Islands and Capes National Reserve, protecting Inca Terns as well as sea lion breeding colonies on 28 guano islands and cliffs along the coastline.